I drafted a pattern for the cuffs based on #1 of the cuff designs to the right. I wasn't sure why it has the stitches around the centre, however. Was it made in two halves and assembled? 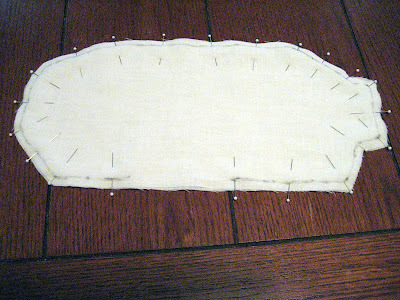 That's what it looks like, with the seam stitched, and then a row of topstitching on either side. Well, I made my cuffs as one piece, but added a row of stitching around the centre in any case, figuring it will help keep it from stretching out of shape. 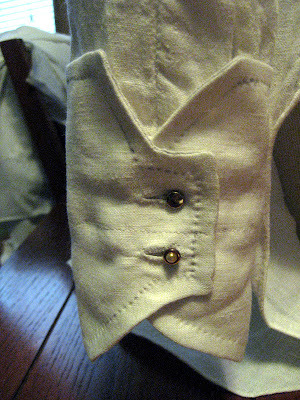 Maybe by making the cuffs in two pieces helped use up smaller pieces of cloth the shirt makers had lying around. 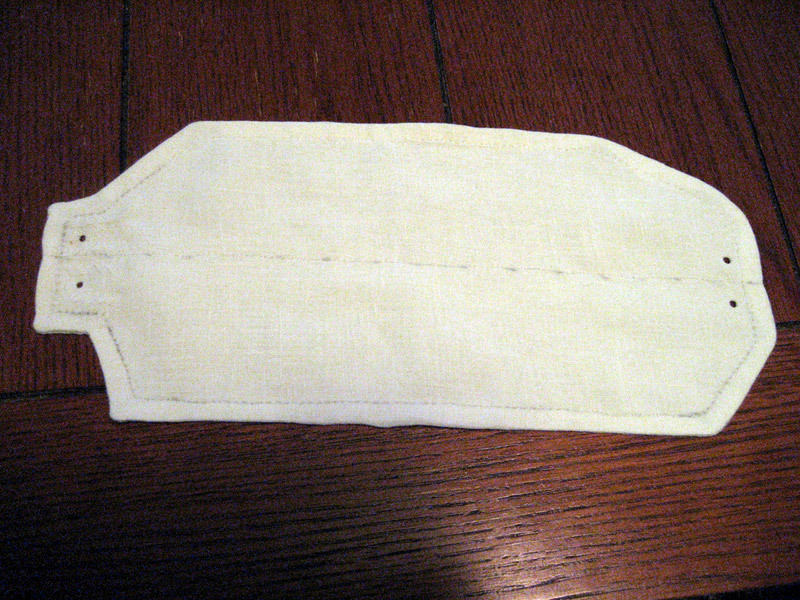 I added a quarter inch seam allowance to my pattern, and prepared to sew it. Like the collar I used two layers of fine linen for the outer pieces, and a slightly heavier linen for the interlining, in order to absorb more starch and keep it stiff. Here's a cuff with the centre stitching completed, and prick stitched around the outer edge. 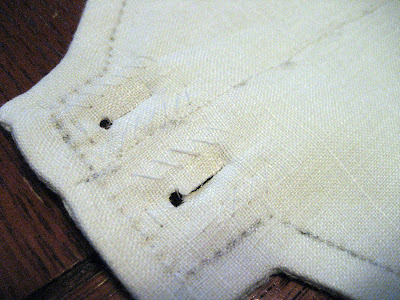 I've punched holes for the buttonholes, but haven't cut the slits yet. I'm going to baste the layers together first so they don't move around once I cut the slits. Here's the basting, and the slits cut. Once again I used a half-inch chisel to cut the slits, including the diameter of the punched hole in the length. 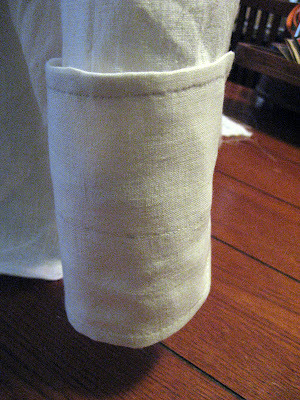 The cuff fastened on the sleeve. The top stud is a button stud, which goes through all four layers: the two cuff band layers of the sleeve and the two layers of the cuff itself. That holds it onto the sleeve. The bottom stud is actually a collar stud until I get some button links that I want to use. I could use cufflinks, but the links with the swivel foldy bit (technical, I know) aren't period correct for a Victorian shirt. Button links are two shank buttons connected by a little loop of metal - basically just a double-headed button. The view of the cuff most people will see. Well, they'll only see an inch or so peeking out from beneath a coat. That's the hard part of spending so much time on a shirt - people will only see a little flash of white, and the rest is always hidden. Oh well, I'll know (and so will all of you, having seen the whole process). The last step is to wash out the chalk marks and starch and press the collar and cuffs. Then it's on to the next project!